Once you have your Account settings configured you want to change the privacy settings in Facebook to protect your personal information. Facebook Privacy settings allow you to change who can see post on your timeline as well as who can post to your timeline or Tag you in a photo. 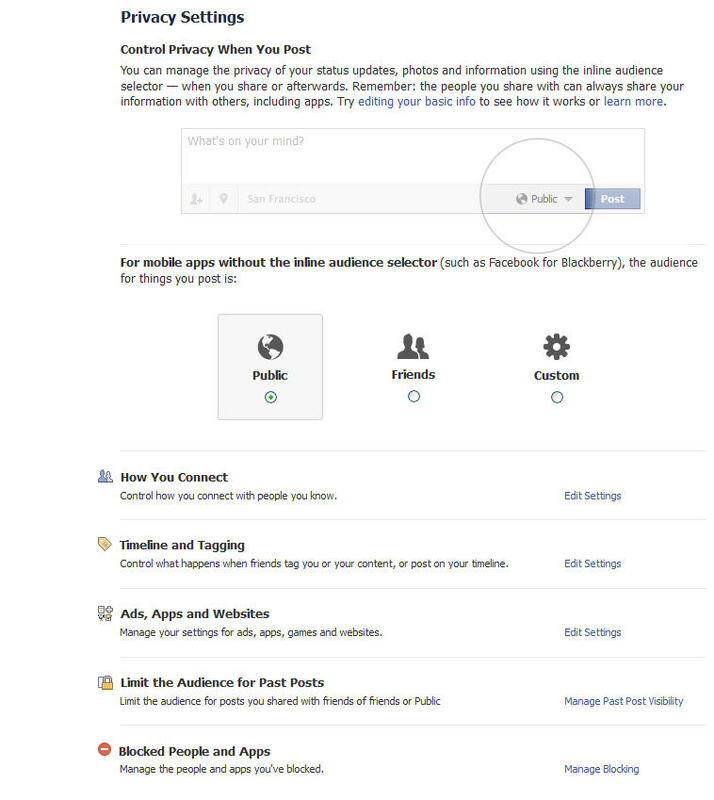 If you havent updated your Account settings yet you can find instructions at How to protect Facebook | Account Settings. Unlike your Account settings which improves the overall security of your Facebook account the privacy settings are more complex because the more you improve your privacy the less you can see and do in Facebook. I will explain what you want to think about when setting your Facebook Privacy. To change your privacy you will want to go to Privacy Settings under the drop down arrow. 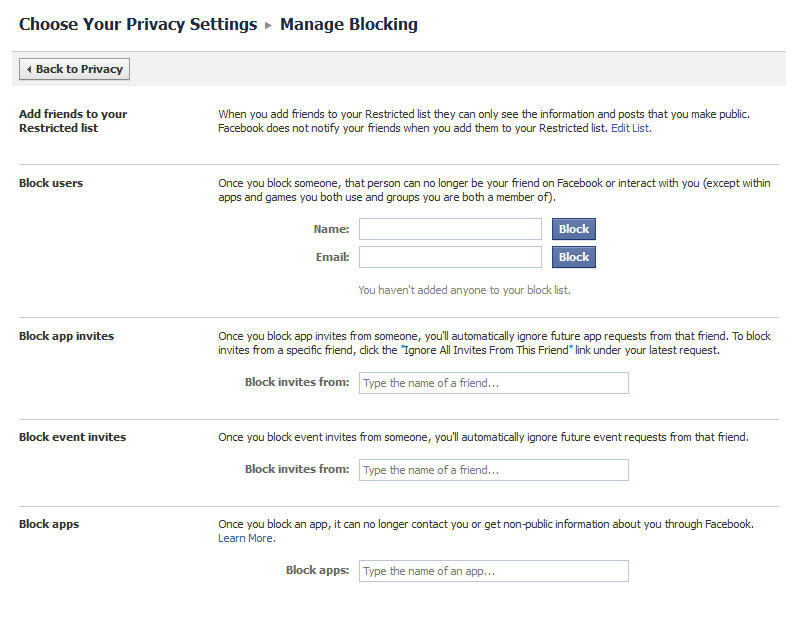 This page holds all the privacy settings for you Facebook account and it is important to check these settings. At the very top the first setting ask what level do you want to set as default when posting from a mobile app that doesn’t let you choose. You can choose from public, friends, and custom. How you connect is the next setting you can configure this has to do with who has access to your email address and phone number on Facebook. If you leave the setting to everyone then people can find you easier but you also leave a hole open for someone to get your personal email address and phone number. You can choose Everyone, Friends of Friends, or Friends. Here you can choose who can send you a friend request and a Facebook message. I have them both set to Everyone because I can always turn down a friend request and delete a message and I don’t think that causes a real risk to my account. The next Privacy setting you can configure is Timeline and Tagging here you can choose settings related to posting and viewing your timeline and who can tag you in photos. These settings are not concerned about securing your account but managing your timeline and whether you want to review tags before they are posted. Your first Timeline setting is who can post on your Timeline? This setting is easy you can allow Friends or No One those are your choices and because I like it when my friends post to my Timeline I leave it on Friends. Below is who can see what other people have posted on your timeline so this has to do with if you allow friends to post who can view those posts. I have everyone selected because I like what my friends post on my Timeline and I don’t mind who sees it. 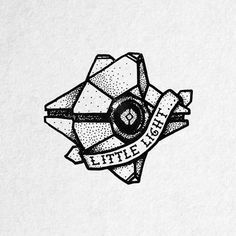 You have a lot of choices for this setting you can pick from Everyone, Friends of Friends, Friends, Custom; you can even choose to limit it to a list of Friends you have created. If you have Friends that post personal information on your Timeline you can either block them from posting or use this setting to limit who can see those posts. The last four settings a related they have to do with you being tagged in a post and who can see those tags. First you can choose to review all posts that you have been tagged in before they are publicly added to your timeline. This is nice if you want to stop your friends from posting embarrassing pictures or posts. You can also use this setting to review all posts with you tagged before they are publicly posted to see if there is any personal information in the post you don’t want. You can also limit who can see posts you have been tagged if you only want your friends or a list to see tagged posts you can set that here. The next setting lets you review any tags that have been added by friends to a post you have made this is like the setting above if you feel the need to stop a friend from tagging you in a post you made you can enable this. 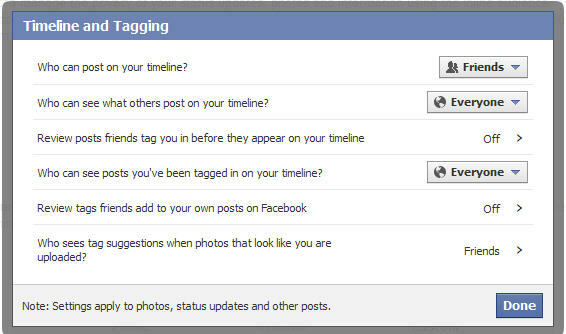 The last setting deals with when someone uploads a photo or makes a post who can get suggestions from Facebook for you. When a photo that looks like you is uploaded, Facebook will suggest adding a tag of you. This helps save time when adding tags to photos, especially when labeling many photos from one event. Suggestions can always be ignored and no one will be tagged automatically. With this setting you can choose Friends or No one so if you are worried about being tagged in photos you can select no one. The last privacy setting I am going to talk about is blocking people and apps. This is helpful when you keep getting spammed by a friend but you are not ready to unfriend them. With these settings you can add friends to a restricted list which will keep them as friends but they will only see posts that you have made public. This could be a good idea when you are friends with coworkers, or family friends that you don’t want them to see posts for your friends. Facebook does not notify that friend they have been added to restricted list so you can do it discreetly. You can go a step further if someone is really spamming you and upsetting you then they can be blocked which means they are no longer friends and cannot interact with you at all on Facebook. If you are like me you have friends who always send invites to games or other apps you are not interested in. Facebook allows you to choose friends you do not want to get any app invites from and they will block them totally so that persons app invites will not fill your notifications. Facebook also lets you block event invites from someone although I don’t think this is necessary very often but it can be done from privacy settings. The last settings is if you wish to block an app from sending notifications to you or contacting you this can be done with block app settings. You can block the app by just entering in the name of the app and then it will be blocked. That is it after going through the settings above you have increased your Facebook security no just so you know this is not a guarantee at all your account can still be hacked and your information taken there will always be security holes on the internet and I am not responsible for anything that happens to you. After saying that I believe that changing your security settings is the very least you can do to try and protect yourself. When on Facebook you want to be mindful of what you are saying and who you are saying it to. If write a public post saying I decided not to put Antivirus on my computer because I don’t need it then you just told everyone on Facebook your computer is vulnerable and it is not hard for hackers to find and attack your computer. I would hope no one would do this but it is easy to open yourself up to an attack by just posting one thing publicly on Facebook. I hope this tutorial was helpful and you were able to improve your Facebook security, just remember who you are talking to when on Facebook. Here are links to get more information about Facebook security settings.